The Readco Continuous Processor is a twin shaft, co-rotating mixer, designed to mix one or more dry materials with one or more liquid materials on a continuous basis, producing a homogeneous product at the discharge end of the unit. Said to be highly flexible and sturdy, the twin screw design of the processor mixes, processes and extrudes, giving a consistent mix for a range of applications. The system is suitable for operations involving reaction, polymerization, crystallization, compounding and heating or cooling of materials up to many million centipoise viscosity. 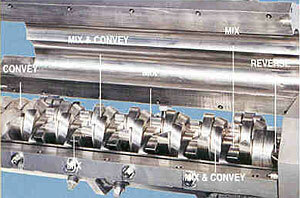 The standard features of this mixer are designed to save time in both processing and clean-up operations. The co-rotating shafts and close clearances between the paddles and between the paddles and barrel walls provide uniform mixing in less time than conventional mixers, according to the supplier. Multiple liquid and dry material addition points allow users to add ingredients and increase flexibility in processing. Readco Manufacturing, Inc., 901 S. Richland Ave., P. O. Box 15552, York, PA 17405-0552. Tel: 717-848-2801; Fax: 717-848-2811.